Warbirds over Delaware 2012 » Chesapeake Bay Radio Control Club - Welcome to CBRC! 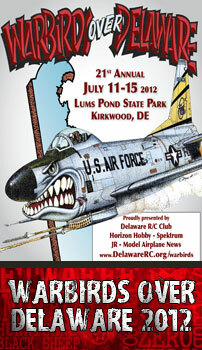 The Delaware R/C Club is proud to host the “Warbirds Over Delaware” R/C airshow event every summer! For over 21 years the Delaware R/C Club has sponsored this warbirds event which attracts modelers from all over the country! All aircraft flown during the event hours must be a scale warbird and meet IMAA specifications of 80″ wing span for monoplanes or 60″ wing span for multi-wing aircraft or 1/4 scale or larger. From vintage WWI aircraft to modern jet fighters you will be sure to experience the thrill of it all! Both flying and static displays will be available for spectator viewing. Special spectator area will be available that provides unobstructed view of pilots, runway and fly-over areas. Pit passes will be available for purchase that will allow spectators to gain access to static display areas. Food will be provided by the Boy Scouts Troop 30. Half-time show starts at 12:00 Noon each day. Spectators must park at the R/C Flying field on Wednesday and Thursday. Subject to availability. Park entrance fees apply. Information for spectators can be found here. Warbirds Over Delaware is an AMA and IMAA scale event. All pilots must have a valid AMA and IMAA membership. A pilot landing fee of $25 (Overnight RV campers will pay a reduced rate) will be charged. This fee will cover your vehicle State Park entrance fee, provide a ticket in the pilots-only raffle, and the pilot’s ticket for the expanded Saturday evening BBQ. All fees will be collected after arrival. There is no pre-payment. Pilot pre-registration is now closed. You may still register at the event! Vendor registration form is available here. Local lodging information is available here. Onsite RV overnight parking is available on a first come, first served basis. RV must be self contained. No tent camping permitted at the R/C Flying Site. Additional park fees apply for overnight camping. Camping fees will be collected each night by the Park Rangers. 1. Campers MUST be self-contained and set up where directed by the event staff. 2. Flying field camping is limited to event participants and handicapped. 3. The camping fee will be collected by the Park staff after the camper arrives at the field. 4. Non-self-contained campers MUST set up at the regular Lums Pond campground; self-contained campers may set up at either the flying field or the campground. RV and tent camping is available off site of the R/C Flying Field approx 1 mile at the Lums Pond State Park Campground. For details, call 877-987-2757 or reserve online at www.delaware.reserveworld.com Please note: this only applies if you are camping off site. Do not contact the Park if you intend to RV camp at the Flying Field. RV camping details will be available at the event registration tent. U.S. President Abraham Lincoln's funeral train left Washington.